Are you ready to die younger than your parents? It may not be what you want, but for society it is not at all that bad. In the years to come, we will literally drown in healthcare costs, but declining longevity, which is an emerging trend, could just about solve that problem. Some of you may have read my recent research paper on declining life expectancy, and may therefore be inclined to file this Absolute Return Letter without further ado. Before you do so, beware that I have made quite a few changes, following the feedback I received. Enjoying a KFC regularly? If you do, don’t eat too many of them. In 13 counties across the US, people can now expect to die younger than their parents did, and the eight counties with the biggest decline in life expectancy since 1980 are all in the state of Kentucky. Before I get a lawsuit on my hands, let me point out that KFC is not to blame for this most unfortunate trend, but obesity certainly is – at least partially. Having said that, this month’s Absolute Return Letter is not about pointing fingers. I will, probably to the surprise of many and to the disgust of a few, look at various implications – mostly positive – of declining life expectancy. Positive implications? Am I being serious now? I certainly am, but I am also being quite cynical. Hence, in the following, when I discuss the positive implications of falling life expectancy, I completely ignore the human angle. The following is entirely a macroeconomic discussion, and I hope you will forgive me for being so ‘non-humane’. 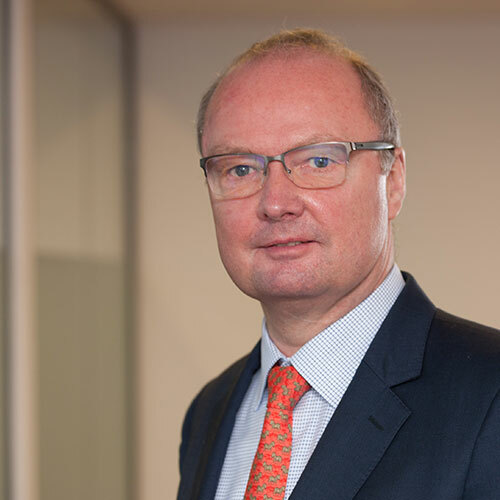 Before I start, I should thank Andy Lees of MacroStrategy Partnership, Paul Whiting of Securis and Jan Frøshaug of Trafalgar House Pension Trust for their help and advice on this rather complex topic. It is much appreciated. And now to a tiny bit of marketing – which I don’t do often, so please don’t yell at me. Back in May, as you may recall, I wrote an Absolute Return Letter called Investment Rules. That letter has formed a chapter in a new book called Harrriman’s New Book of Investing Rules which has just been published. The first volume of that book came in 2001 and was a great success. The sequel, with hundreds of pages of compelling content, brings you the arguments of the very best investing minds around the globe in one unputdownable book (Harriman House’s words – not mine). I am very pleased to be associated with all those great minds and would suggest you put it on your wish list for Christmas – here is the link: https://harriman-house.com/newbookofinvestingrules. As many of you already know, I also have my own book in the pipeline. The manuscript has now been handed over to the typesetter, and the book should be published in March of next year, but more about that in the months to come. Back to business. Why has longevity started to decline in some countries? To begin with, let’s look at where people can expect to live the longest. As you can see in Exhibit 1, the 10 countries enjoying the highest life expectancy are not exactly home to the poorest people of this world. Monaco stands out, head and shoulders above any other country. Being a tiny enclave in southern France, you wouldn’t expect life expectancy there to be dramatically different from that of (the rest of) France, but it is. As is obvious when looking at Exhibit 2, climatic differences is an explanatory factor, and so is GDP per capita. Many elderly die every year as a result of the cold winters in Northern Europe, and emerging Europe is still miles (or, in this case, years) behind developed Europe. Likewise, variations in lifestyle (e.g. smoking, drinking and/or eating habits), can make a difference. Take my home country Denmark, where life expectancy is lower than it is in the rest of Scandinavia, and that has a lot to do with the fact that there are more smokers in Denmark. Having said that, neither climate nor lifestyle explain almost eight years. Residents of Monaco are exceptionally wealthy, and money can buy you lots of things - better healthcare, but also better education (which often leads to a superior lifestyle), better quality food and other things that affect mortality. With all that money, they effectively buy almost eight years of extra life when compared to France overall. The high cost of healthcare in the US, on the other hand, proves that just throwing money at it systemwide doesn’t buy you anything. The US is a meagre number 43 on the global list of countries benefitting from the highest life expectancy; yet it spends by far the most money on healthcare when measured as a percentage of GDP (Exhibits 1 and 3 respectively). For the first time since 1993, life expectancy for Americans declined in 2015, and a sharp rise in fatalities from lifestyle diseases was given as the main reason (Note: See the 2015 numbers here. The 2016 numbers are not out yet.). Overall, US life expectancy declined fractionally from 78.9 years in 2014 to 78.8 years in 2015 (Exhibit 4). The average American spends over $10,000 annually on healthcare. As recently as 1960, the annual cost per capita was only $146. Even when adjusting for inflation, the cost per capita is still nine times higher today than it was back then (see here for more on this story). The cost per capita, and total healthcare expenditures as a percentage of GDP, can only rise further as the population ages. It is expected that, by 2023, the average American will spend as much as $15,000 per annum. Let’s drill further down on those numbers. Senior citizens make up about 14% of the US population but account for more than one-third of total healthcare spending. We just learned that the average American spends about $10,000 annually on healthcare. I can now reveal that the average working-age American spends a tad more than $6,000 per year, and the average senior citizen (aged 65 and over) more than $20,000 per year (see here). Even worse, the average American in his (or her) 90s spends almost $30,000 annually (much of it on nursing homes), and it costs American society about $60,000 to keep somebody alive during the last year of life, with almost the entire increase accounted for by a dramatic rise in medical expenses. Over 80% of that cost is picked up by Medicare (71%) or Medicaid (10%). In other words, the ageing of the American populace will have a rather dramatic impact on public spending in the US, even if the healthcare model over there is predominantly private. I often run into the argument that ageing is much less of an issue in the US than it is elsewhere (and I often say so myself), but that is only partly correct. In its favour counts the fact that the US workforce will continue to grow; i.e. there will be more to pay for those who no longer work. 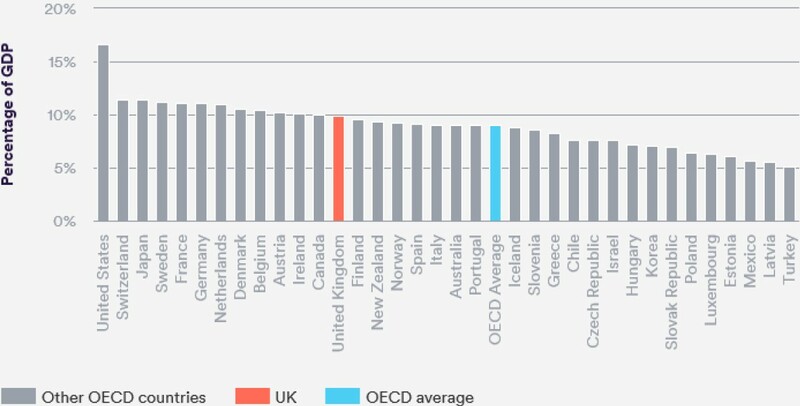 On the other hand, one has to adjust for the fact that the US healthcare system seems rather inefficient and very expensive when compared to other countries. In the UK, in every year since 2012, more people have died than in 2011. The number of deaths peaked in 2015 with 50,000 more people dying that year when compared to 2011. Although the number dropped modestly in 2016, 40,000 more people still died last year relative to 2011. 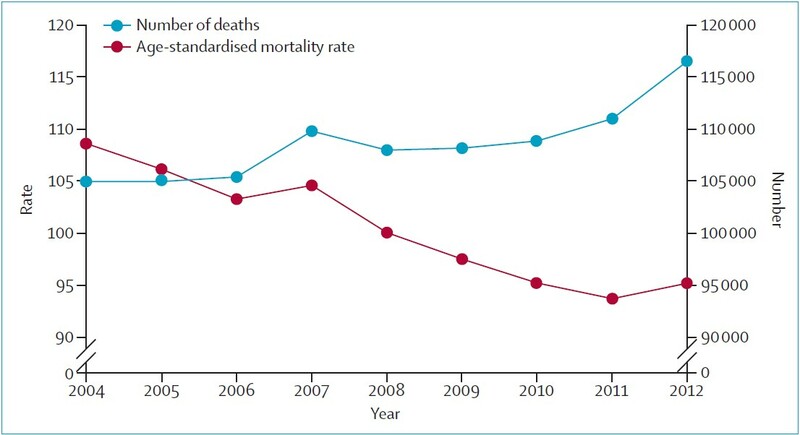 Before you argue (as I first did) that it could quite possibly be a blip on the curve, beware that the increase in deaths is statistically very significant (above 99.5% significance). Moreover, no part of the UK has escaped. Scotland (+7.4%), Wales (+9.1%), Northern Ireland (+9.5%) and England (+9.4%) have all seen a meaningful increase (Note: Source: The Public Service Consultants). Quite interesting, though (if I am allowed to use that word when talking about premature deaths), the UK seems to be the most affected of the bigger European countries. I haven’t checked every single one, but I have struggled to find any other European country apart from Greece, where actual deaths so dramatically exceed the predicted number of deaths. It is the 85+ year olds who have died sooner than expected – why could that be? This letter is not primarily about finding an answer to that question, but allow me to briefly mention some of the explanations I have come across in my research. One explanation that most definitely doesn’t fly is that baby boomers have begun to die prematurely. The oldest baby boomers are now in their early 70s, and mortality rates for that age group are very much as predicted. The ongoing climate change is another explanation I have come across, but that one doesn’t add up either. More elderly die when it is cold, but the last five winters have been exceptionally warm in the UK. Furthermore, the increase in UK mortality amongst the elderly has been sustained year-round. What could it be then? An increase in lifestyle diseases such as obesity? That is certainly possible, although the increase in obesity has flattened in the UK since 2010. That said, five years of lifestyle data is not enough to draw any firm conclusions from. The single biggest explanatory factor is the increase in the number of deaths from dementia and Alzheimer’s. Between the two, the number of deaths rose from 25,000 in 2010 to 62,000 in 2015; however, it doesn’t explain the entire increase, which has led me to search in a slightly different direction. 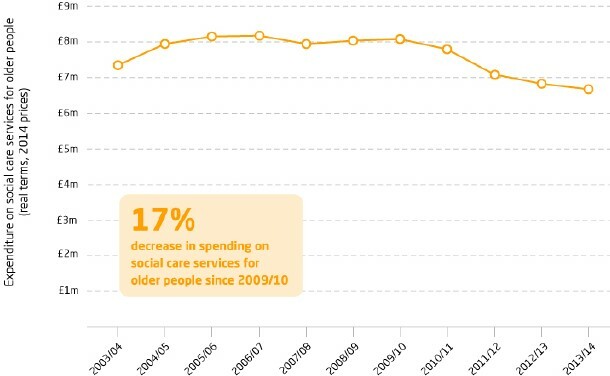 Think about the decline in the money spent on social care aimed at the elderly in the UK (Exhibit 5 (Note: Although the chart is only updated through 2014, if anything, I would expect it to look even more grim today. )), and think about how that could affect mortality. Unless quality has miraculously risen (which I very much doubt), it is not entirely impossible that the government is indirectly responsible for the rise in the number of deaths in the UK. As we all know, the elderly don’t get the same level of care anymore. Having said that, as I don’t intend to accuse anybody of manslaughter, let’s drop the ball right there. Researchers have found a statistically significant link between mortality and austerity. Greece is the perfect example. As the crisis unfolded in Greece in 2008 and the years thereafter, more Greeks died than suggested by the mortality tables (Exhibit 6). In 2012 alone, more people died in Greece than in any other single year since 1949 and, just like in the UK now, first and foremost, it was the elderly who paid the price. In other words, it is not entirely impossible that the fallout from the financial crisis and the decline in real wages in recent years is at least partly responsible for the rise in mortality rates, and that the longevity curve will return to pre-crisis levels as things return to normal (if that ever happens). The unprecedented number of deaths amongst the British elderly in recent years has started to affect UK life expectancy which, as far as the middle-aged and the elderly are concerned, started to decline in 2014 (Exhibit 7). New data from the Office for National Statistics (ONS) suggests that projected life expectancy at birth has also started to decline. A drop of 0.9 years for both men and women is in the cards when using 2016 data, according to the ONS (see here). Let’s take that line of thought one step further. As I just pointed out, productivity growth leads to GDP growth. Now, think of human capital and how it forms part of the total capital stock at our disposal. If fertility grows faster than productivity, other parts of the capital stock must be depleted – simple as that. As life expectancy ultimately depends on the capital stock at our disposal, an eroding capital stock will inevitably lead to declining life expectancy. On the other hand, if productivity were to grow faster than fertility, the capital stock would rise, leading to accelerating GDP growth, improving health and rising life expectancy. In the past, when fertility grew faster than productivity for any length of time, something always happened which cleared the system. (Note: The thinking here is similar to the principles laid out by Robert Malthus in his 1798 book, An Essay on the Principle of Population.). Today, as the worldwide population continues to grow with no or little productivity growth to support it, resources are depleted ever more rapidly, and that will eventually cause the system to clear. In the past, famine was often the outcome. In the future, (longer term that is), one possible outcome is that millions of people are going to die from ailments that you can treat with antibiotics today. If you think that is a step too far and that I am about to lose the plot, I suggest you do a bit of research on antibiotics. If you aren’t already aware, the efficacy of antibiotics is not what it used to be. More and more ailments cannot be treated with antibiotics any longer, and there is no alternative. Although that sounds rather worrying, reduced longevity has a number of positive implications (for society). As I just pointed out, if fertility grows faster than productivity, GDP growth slows down, which is a major challenge for heavily indebted countries, and that could force many to default on their obligations to the elderly (state pensions, social security, etc.). If longevity falls, the risk of governments defaulting on those obligations will decline. How could it otherwise affect the economy? Let me give you an example. Around the world, more and more parents are struggling to finance the education of their children. Wages are under pressure and savings not large enough. 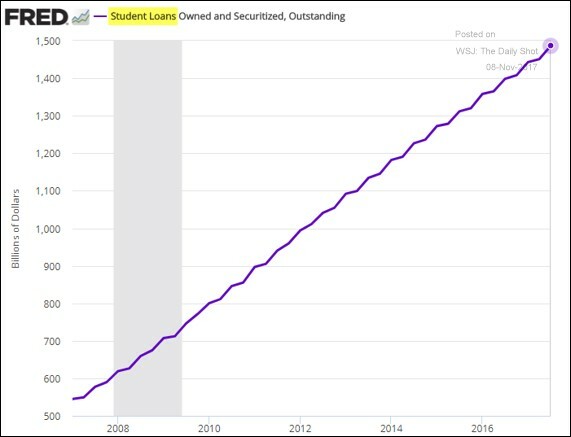 Consequently, more and more young people borrow to finance their studies (Exhibit 8). If society were to spend less on healthcare for the elderly, more money could be made available to educate the young. 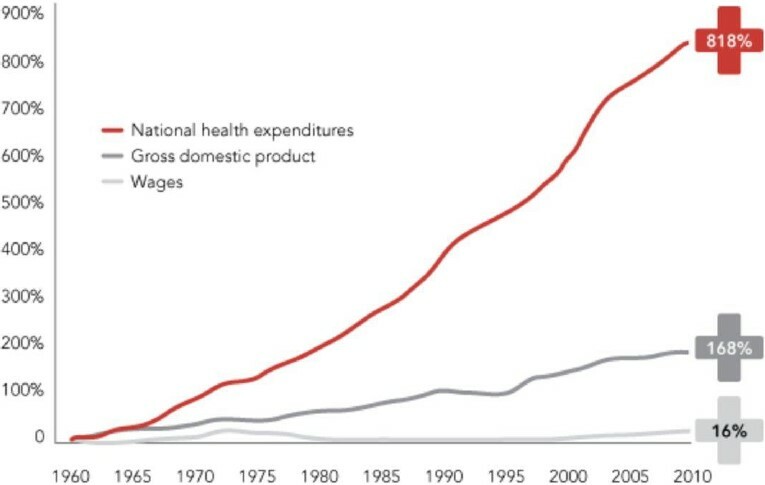 Specifically, as far as healthcare costs are concerned, if we (as a society) would accept that we are not necessarily entitled to enhanced longevity, the dramatic rise in healthcare costs over the last few decades (Exhibit 9) could be curtailed. We just need to accept that better healthcare doesn’t come for free. We must earn the right. Squeezing that little extra longevity out is becoming exponentially more expensive, and a cut in healthcare costs would make more money available for productivity enhancing purposes – including the education of our children. 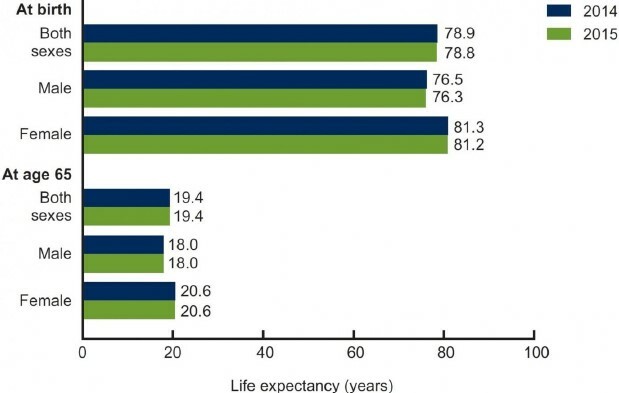 Another major advantage associated with declining life expectancy is the impact it would have on our pension system. The UK economy suffers from a very high number of underfunded (or entirely unfunded) DB pension plans, with the aggregate funding deficit adding up to more than £10 trillion (5-6 times UK GDP). The drop in UK life expectancy from 2015 to 2016 translates into a fall in pension liabilities of about 2%, and that is the effect of one year’s fall only. If interest rates rise meaningfully (but not dramatically), and life expectancy continues to drop modestly (but not dramatically), this could turn into the best of all worlds. A very sick UK pension industry would suddenly stand a reasonable chance of surviving. Human capital forms the largest part of the capital stock at our disposal. When the growth rate of the working age population peaked in the early 1980s, we could have chosen to redirect much of the capital invested in humans to other productive technologies, but we chose to invest much of it in enhanced longevity instead (hence the rapidly rising healthcare costs). In a few words, at least from a productivity point-of-view, that was an absurd misallocation of capital. The wise people at the UN expect global life expectancy to rise further. By 2030, it is expected to improve a further 3 years, and by 2050 a further 6½ years from 2015 levels. That is all fine, but there is a major but. According to the IMF, a 3-year extension to life expectancy would drive debt-to-GDP 50% higher. Can we afford that? Most definitely not. Hence it is not entirely impossible that the first signs of reduced life expectancy are simply the first signs of society no longer having the money required to further improve longevity. One could also argue that, instead of us all living a few months longer at an astronomically high cost, the money would be much better spent on educating our children better. Let me finish where I began – with the example of the inhabitants of Monaco living so much longer than those of France. The fact that governments around the world will increasingly be forced to pass on new medical technologies, as they cannot afford them, will have little effect on life expectancy amongst the wealthy. They will just pay for it themselves – as they do in Monaco already. The wealthy will therefore live much longer (as they already do in Monaco), but the man in the street will not, as he is funded by the government, and governments all over are fast running out of money. Have a most enjoyable Christmas.